Isle of Jura Prophecy Malt Whisky is a popular Whisky available from DrinkSupermarket.com in 70cl to buy online. 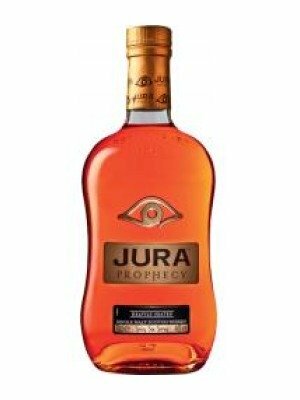 Visit DrinkSupermarket.com for the best price for 70cl of Isle of Jura Prophecy Malt Whisky or compare prices on our other Whisky products. Heavily peated with fresh cinnamon and spicy sea spray Single malt Scotch whisky Taste Meticulously crafted from a selection of the finest and rarest aged Jura single malt whiskies, Prophecy is a profoundly peated spirit. Peat smoke, fresh cinnamon and spicy sea spray lead the first assault. Finally the tarry bonfire notes slowly give way to hints of soft liquorice and nutmeg. In a world of its own The Isle of Jura can be found nestled off the west coast of Scotland. It's a place famed as much for its folklore as it is for its whisky. A magical haven where a sense of solitude pervades: one road, one pub, one community and one distillery. There is no whisky and no island quite like Jura. It truly is in a world of its own. The story In the early 1700's the Campbells of Jura evicted a wise old seer blessed with the ability to foresee the future. Bristling with resentment, she prophesied that when the last Campbell left the island he would be one-eyed and all his belongings would be carried in a cart drawn by a white horse. Over time the story became legend, the legend became myth and the prophecy drifted from memory. That is until 1938, when Charles Campbell, blind in one eye from the Great War, fell on hard times. It was a cold, unforgiving morning when he and his horse made their way to the old pier for the last time. Become a Diurach Diurachs is the Gaelic name for the people of Jura. Proud of our land and our whisky, we are a small and close-knit community of fewer than 200, united by the island we love and the warmth of its people. With a dram of the good stuff in hand, we toast the health of our friends near and far. Become an honorary Diurach and join us. Life doesn't get any better. Where to buy Isle of Jura Prophecy Malt Whisky ? Isle of Jura Prophecy Malt Whisky Supermarkets & Stockists. You can buy Isle of Jura Prophecy Malt Whisky online in most retailers and find it in the Whisky aisle in supermarkets but we found the best deals online for Isle of Jura Prophecy Malt Whisky in DrinkSupermarket.com, TheDrinkShop, and others. Compare the current price of Isle of Jura Prophecy Malt Whisky in 70cl size in the table of offers below. Simply click on the button to order Isle of Jura Prophecy Malt Whisky online now.